It seems to happen every month, like clockwork. Your skin appears to be clearing up nicely when suddenly it begins erupting in breakouts again, just around the time of your period. Could you be imagining it, or is premenstrual acne a real phenomenon? Premenstrual acne is a real phenomenon. Premenstrual acne, often dubbed "PMS acne", is a consistent flare up or worsening of acne every month, coinciding with the menstrual cycle. Depending on which study you look at, premenstrual acne happens in anywhere from 50% to nearly 80% of women. Some find that their existing acne gets worse right before their periods. Others have relatively clear skin during the rest of the month, only breaking out a week or so before their periods. Those PMS breakouts are different than your "typical" breakouts. They tend to be red and inflamed papules which rarely develop a white head. These breakouts appear mostly on the lower part of the face — cheeks, jawline, chin, and neck. Your menstrual cycle can directly impact your skin and hormones are to blame. Just like hormones trigger acne development during puberty, hormones also play a big role in the breakouts you get right before your monthly cycle. Hormones are responsible for the acne that gets worse during pregnancy and menopause, too. Specifically, we're looking at testosterone. Although we think of testosterone as a "male" hormone, women make it too, just in lower levels than men. Testosterone has been implicated as a factor in acne development because it triggers your sebaceous glands to produce more sebum (or oil). For most, breakouts happen about a week to 10 days before the period begins. This is the time when estrogen is at its lowest. Testosterone levels stay fairly constant throughout the month, so as estrogen drops testosterone is relatively higher. Another hormone, progesterone, also plays a role. Its levels rise during the second half of your cycle. Like testosterone, progesterone can also make your skin more oily. But it can also cause your pores to swell shut. This creates a perfect storm for breakouts: your skin is more oily, and that oil can more easily become trapped in swollen pores. 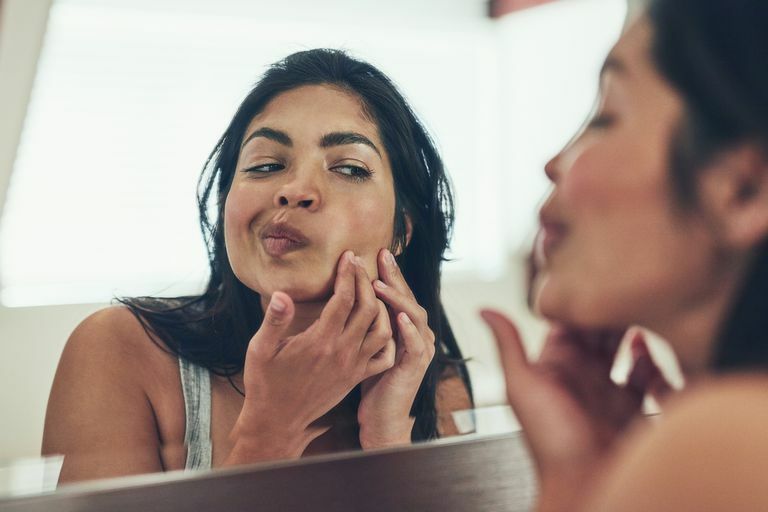 There may be other factors at work as well, and more studies are still being done on exactly how the menstrual cycle affects acne and the skin in general. You don't have to simply endure these monthly breakouts. There are treatments that can help get them under control. Birth control pills: Oral contraceptives have long been used to reduce acne breakouts, presumably because they help regulate hormonal fluctuations. Benzoyl peroxide: This common acne medication works well on hormonal breakouts too. If your acne is mild, an OTC benzoyl peroxide may be all you need. Prescription benzoyl peroxide is an option if you need something stronger. Topical retinoids: This is another prescription medication that works great for adult breakouts. They help keep those pores clear and can reduce fine lines and wrinkles too. Spironolactone: If you're having trouble getting your acne under control, this hormonal regulator may be an option for you. Spironolactone is a prescription medication that you take orally. Don't curse your skin this month. Instead, see your dermatologist and look forward to clear, healthy skin all month long. Kim GK, Michaels BB. "Post-Adolescent Acne in Women: More Common and More Clinical Considerations." J Drugs Dermatol. 2012 Jun; 11(6):708-13. Raghunath RS, Venables ZC, Millington GW. "The Menstrual Cycle and the Skin." Clin Exp Dermatol. 2015 Mar; 40(2):111-5. Stoll S., Shalita A., Webster G., Kaplan R., Danesh S., Penstein A., "The Effect of the Menstrual Cycle on Acne." Journal of the American Academy of Dermatology (2001); 45 (6): 957-960.